Pollution is on everyone's lips but no one considered the quality of the air within workplaces. This air may be endangering our health. Find out how to run a successful business and keep your employees healthy. In logistics companies, high dust levels are often impossible to avoid. Lots of movement in the halls and significant speeds when loading and unloading sometimes cause extreme particle-matter load, especially due to the abrasion of the forklift wheels. When the hall doors open and close, dust is swirled around, and new dirt is brought in and distributed across the space. This poses major challenges for the highly active locations of DB Schenker. 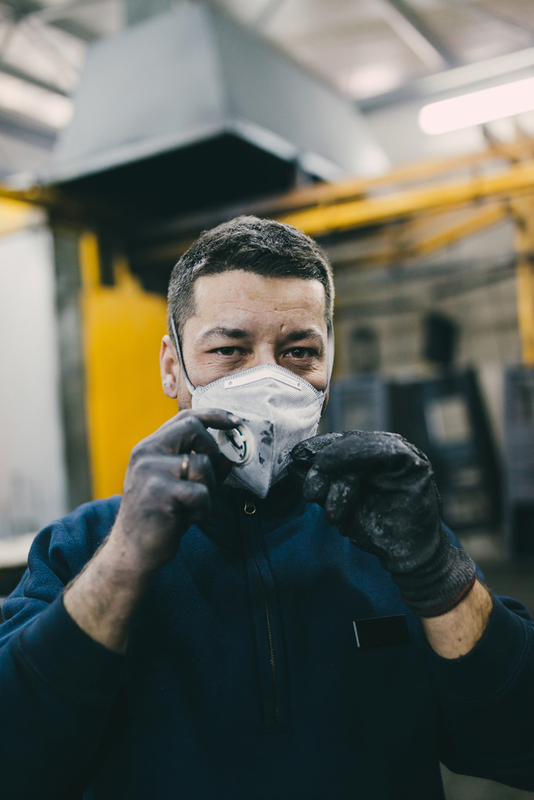 A high particle-matter load jeopardises not only the quality of the goods and services, but above all the health of the workforce: a high concentration of dust in the air makes it harder to breathe, increases the risk of illness (such as asthma) and can even cause cancer. These findings preyed on the minds of the managers at DB Schenker too, particularly when they carried out their own observations on site. When dust collects on the ground, the risk of slipping increases for forklifts, pallet trucks and pedestrians alike. In order to keep all these risks more or less under control, intensive cleaning was required – but didn't always yield satisfactory results. The managers at DB Schenker were in agreement – it was time to act. The initial impetus came from within the company's own ranks. A colleague reported on Zehnder air cleaning systems that were already successfully in use at other DB Schenker locations. The managers invited Zehnder along, and the experts came, provided information and made a convincing case. The “Clean Air” project could begin. Industrial air cleaning systems from Zehnder Clean Air Solutions have been installed at two DB Schenker locations – in Dortmund and Langenhagen/Hanover. The principle: the systems filter dust particles from the air before they can be inhaled or spread across the space. The secret is a patented filter combination. The Flimmer filter uses mechanical and electrostatic charge to bind fine and coarse dust, while the downstream Media filter traps the dust particles that have not yet been caught. A further argument is that Zehnder doesn't simply sell products – it offers complete solutions and services which are precisely tailored to the needs of the location in question. A full service package also ensures that the customer needn't worry about a thing once the system has been commissioned. Maintenance and filter replacements are provided automatically. The difference was clear to see straight away. The air is now visibly clearer and employees' faces and clothes are clean when they leave the site at the end of the day. Even more importantly: the reduction in particle-matter load can certainly be felt. Employees can breathe more easily, feel better and are more motivated. These subjective feelings were objectively verified by means of measurements – with remarkable results. Depending on the location, a reduction in dust of up to 87% was measured, providing an optimum basis for protecting employees' health. With Zehnder air cleaning systems, DB Schenker is investing in employee health and enhancing the quality of life and productivity of its workforce.